Book an economic private taxi or bus from Malaga airport to Mijas Pueblo with our transfer services filling in the form on the top. Reaching the village traveling by train is possible, although it will take you only to Fuengirola and from there you have to take a public bus to Mijas Pueblo. On your way out of the airport’s Terminal 3 you will see the RENFE station; go to the platform in the direction of Fuengirola. From the airport you cannot go directly to Mijas, thus we provide the most effective combinations: Take a bus from the airport to Torremolinos and from there another one to Mijas Pueblo. Another option: Bus to Benalmadena and from there another direction Mijas. You can even take the bus to Fuengirola and then take another bus to your destination. This is the less convenient option, as the bus stop is far from the terminal and travel time is considerable. As the traveller is required to make a transfer to get to Mijas, we recommend the services of private taxis from Malaga airport. We pick you up at the airport to take you directly to where you indicate. In addition we inform you that we also have private minibuses and buses. The charming village of Mijas situated in the Sierra de Mijas Mountains, is surrounded by other municipalities such as Fuengirola, Benalmadena, Alhaurin el Grande and others like Marbella or Monda. Thanks to the short distance to the Mediterranean Sea, Mijas enjoys the mild climate of Malaga, despite being situated on a higher altitude in comparison to the coastal municipalities. 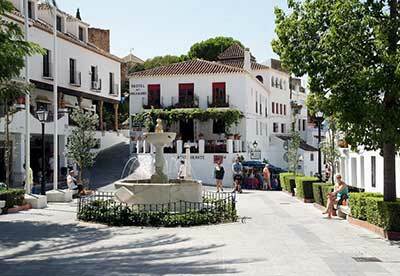 What to do and see in Mijas? Mijas is one of the charming villages of Malaga maintaining its original essence; the municipality known for keeping its traditional architecture of low whitewashed houses. It is certainly what draws the attention of its visitors, making it one of the favourite destinations of tourists Malaga; what can be found in Mijas? 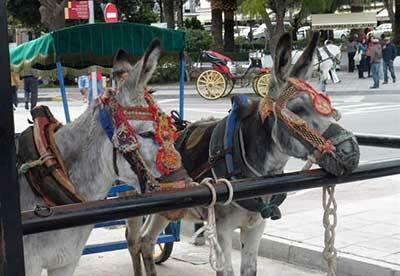 The endearing donkey taxis – who would not want to ride one of these cute animals? – since decades tourists have enjoyed and continue to enjoy a nice ride on the back of one of those Burro taxis. The Gardens and the Mirador of the Wall are two very interesting places not to be missed. The vast majority of tourists choose to visit the view point, with fantastic views showing part of the Costa del Sol, this view is complemented by a walk through the gardens. The oval bullring; obviously it is not one of the most important arenas of Malaga, or the biggest, but it is considered unique in its design and oval shape, a feature that gives it an additional value. 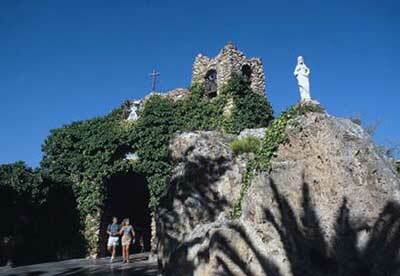 Mijas has several chapels: Our Lady of Remedies, the Calvary Chapel, the Chapel of San Anton located in a beautiful spot on the outskirts of town, the hermitage of el Puerto and the extraordinary Hermitage of the Virgen de la Peña; here we find the Shrine of Virgen de la Peña sheltered by a cave, a beautiful setting that you should not leave behind during your visit. In the Municipal Auditorium are held both cultural and musical events throughout the year. 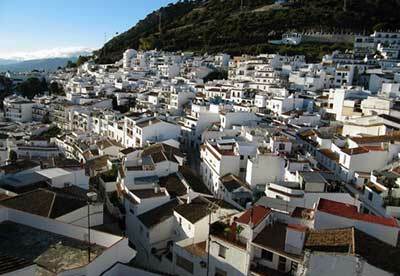 In summer, you can attend a fun festival called Teatro Villa de Mijas. Carromato de Max or miniature museum offers a somewhat different view and fun view as museum. You’ll be surprised to see miniature art works as for instance: The seven wonders of the world represented in sticks, Abraham Lincoln’s head painted on the head of a pin, dried and dressed fleas, the Lord’s Prayer written on the edge of a business card, among many other works. If you want to visit other tourist areas of the city, we can recommend passing by: The Ethnological Museum, the Parish church of Inmaculada Concepcion, the Plaza de la Constitucion, streets and courtyards of Mijas, the church of San Sebastian, the remains of the stronghold of Mijas. If you have time and feel like visiting the coastal area, we recommend become acquainted with Fuengirola. Why use our airport transfer services? Drivers are friendly and speak several languages​​. New vehicles with all insurance, high performance and much more. Day trips to Mijas from Malaga are ideal to visit the most important places of the village, if you want you can hire guided tours in Malaga or just the trip; in any case, go to the contact page, call or write us an email to answer all your questions about the tours in Mijas.